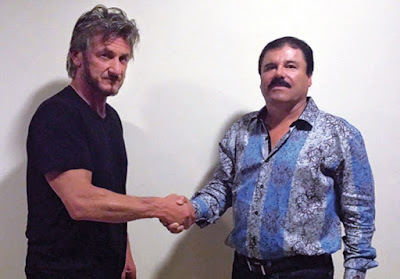 Joaquín Archivaldo Guzmán Loera "El Chapo" spent several hours with actor Sean Penn. The interviews were held in a jungle clearing atop a mountain at an undisclosed location in Mexico. Surrounded by more than 100 cartel troops, and wearing a silk shirt and pressed black jeans, El Chapo sat down to dinner with Penn and Kate del Castillo, a Mexican actress who once played a drug kingpin in the soap opera “La Reina del Sur,”. The interview with Mr. Penn, believed to be the first Mr. Guzmán has given in decades, was published online Saturday night, along with a video portion of the interview on RollingStone. It is not clear whether the contacts described in the story are the ones that led to Mr. Guzmán’s arrest. Mr. Penn wrote that he had gone to great lengths to maintain security while arranging to meet Mr. Guzmán. He described labeling cheap “burner” phones, “one per contact, one per day, destroy, burn, buy, balancing levels of encryption, mirroring through Blackphones, anonymous email addresses, unsent messages accessed in draft form.” Nevertheless, he wrote, “There is no question in my mind that the DEA and the Mexican government are tracking our movements,” referring to the United States Drug Enforcement Administration. A Mexican government official, speaking on the condition of anonymity to describe confidential matters, said the authorities were aware of the meeting with Mr. Penn.